There appear to be a number of different versions of this song. 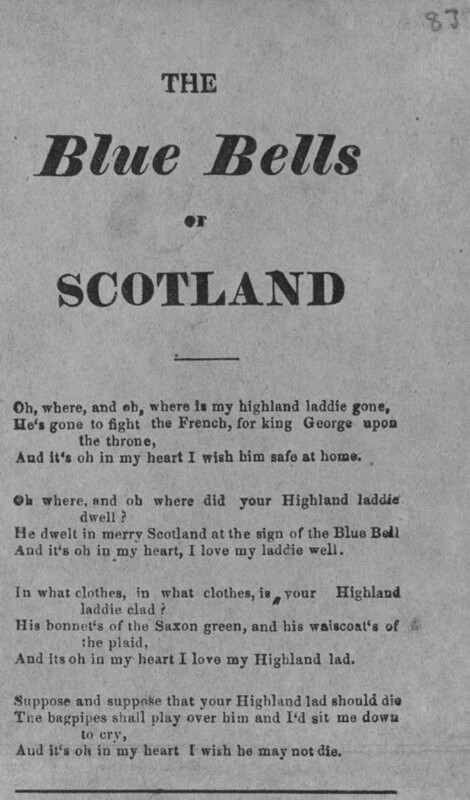 The one that was featured in Volume 6 of the 'Scots Musical Museum' (1803) begins: ' 'O where and O where does your highland laddie dwell; / He dwells in merry Scotland where the blue bells sweetly smell, / and all in my heart I love my laddie well'. In another version, meanwhile, the second line of the song reads, 'He's gone with streaming banners where noble deeds are done'. The words featured on this broadside refer to a young Scotsman going off to fight for king and country during the French Revolutionary and Napoleonic Wars (1792-1815). It is possible that variations occurred as different generations of listeners adapted this common theme.